When a Toyota Prius experiences sudden, unintended acceleration, media reports call it "an unexpected adventure." We seem to recall when Jeeps did the same thing they were called "death traps" and "dangerously deadly." The car had a "cute little body" that Riner loved, and she reveled in driving like a "nerdy Prius owner," watching the energy usage display on the car's center console, trying to drain every possible mile from a gallon of gasoline. [...] Traffic near the mall was congested but moving, and Riner kept the Prius pegged at 60 mph, constantly looking at the console to manage her fuel consumption. Suddenly, she felt the car hydroplaning out of control, and when she glanced at the speedometer she realized the car had shot up to 84 mph. 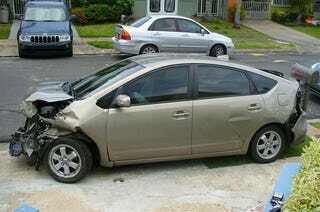 Riner wasn't hydroplaning; quite simply, her Prius had accelerated on its own. Gee, you think those two things — "constantly looking at the console" and "hydroplaning out of control" might be linked? Regardless, Toyota's response was to replace the floor mats, which they say can interfere with the gas pedal. Still, there's no doubt the Prius is still a silent killer. Isolated allegations of unintended acceleration have been an industry issue for many years. In the past, the National Highway Transportation Safety Administration (NHTSA) has investigated allegations of unintended acceleration on Toyota and Lexus vehicles. Neither NHTSA nor Toyota have identified a vehicle-based cause or uncovered any evidence to indicate that a throttle control system failure and braking system failure have occurred in any of these instances. The safety of our customers is of great concern to us and we take these reports very seriously. We will continue to investigate allegations of unintended acceleration on a case-by-case basis and assist NHTSA when necessary with any of its future investigations.